It was movie night, primarily because I was expecting stormy weather. The weather never worsened beyond partly cloudy, wind and a few sprinkles of rain, thankfully. I picked up a DVD any way. I missed this film while it was playing in the theater and took the opportunity to watch it. It is not a Best Picture nominated movie. I viewed it for the pure joy of watching and being entertained, and pondering. 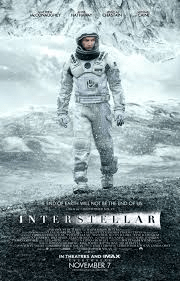 Interstellar stars Matthey McConaughey, John Lithgow, Anne Hathaway, Matt Damon, Michael Caine, Mackenzie Foy, Jessica Chastain, Ellen Burstyn, Timothee Chalamet, and Casey Affleck. It was directed by Christopher Nolan, and is based on the screenplay by Christopher and Jonathan Nolan. This sci-fi/adventure is rated PG-13 for intense action and very brief language and has a run time of 2 hours and 49 minutes. Set in the near future, the earth is slowly dying, devastated by drought and famine. The crops are failing, mankind’s existence is threatened and everywhere, there is choking dust. The remaining population focuses on growing food and surviving. Coop (McConaughey), once an engineer and astronaut with NASA now farms and hopes for a better future for his children, Tom (Chalamet) and Murphy (Foy). A bright, inquisitive child who is bored in school, Murphy is being visited by an entity she calls her “ghost”. Skeptical at first, Coop tells Murphy to rely on science. Yet he too becomes convinced something is trying to communicate, using gravity and an old form of relaying messages….morse code. Given coordinates by this mysterious force, Coop and Murphy discover a secret base, where it turns out NASA has not only survived, in a world where technology is no longer supported by humans, but is seeking a way to save mankind. Coop and Murphy meet Professor Brand (Caine), Coop’s former colleague, and his daughter Amelia (Hathaway). NASA has become aware of an anomaly in space, near Saturn, that appears to be a worm hole. Passing through the wormhole, explorers find themselves in an unknown galaxy. The team headed up by Prof. Brand has been sending missions through the anomaly for a decade, seeking a planet to relocate the people of earth to. Three planets have been identified as possible candidates for colonization. That’s Plan A. Plan B is to populate one of the planets with hundreds of frozen human embryos, starting anew. Coop is asked to head up the crucial mission of visiting the planets to determine suitability. The trip is dangerous, yet it’s the only hope for saving the people of earth. And it may take years. Coop is torn. He wants to stay with his children, who are 10 and 15 years old at this time. Yet it is possible a successful mission will give his children a future, for their generation will be the last to inhabit earth, as the crops continue to fail and the drought continues. Against his daughter’s wishes, Coop agrees to go. Murphy begs him to stay, telling him she’s figured out the message from the ghost in her room. The word is STAY, written in morse code. Heartbroken to leave his children, especially his daughter, Cooper gives Murphy a promise to return, and a watch that is identical to his so that when he returns, they can compare the time. Leaving his son and daughter with his father-in-law (Lithgow), Coop joins the team, heading up the mission into space. The mission is long and fraught with difficult situations and deep disappointments. It would appear that the three planets were not as promising as hoped. The first planet is nothing but water. Amelia Brand, who is with Cooper on the mission, wants to head to the planet that was explored by a man she loves. Coop wants to go where the data is better. They only have enough fuel for one more visit. Amelia proposes that love is a guiding force, as important or perhaps even more important, than data. Cooper makes the decision, relying on science. The discover that the data on Dr. Mann’s (Damon) planet has been falsified. The fear of dying alone drove Dr. Mann to deception. The team has wasted their last attempt to find a habitable planet. Time is passing on earth, much faster than it is for the team members in space. Cooper’s daughter, Murphy (now played by Chastain) is the age he was when he left earth. She works diligently with Professor Brand, looking for solutions to save the planet. Occasionally, she and her brother, (now played by Affleck) transmit messages into space to their father, who can receive them but not respond. They assume their father is dead, but send messages anyway. One such message, directed to Brand, tells her that her father has passed away, and with his dying breath, he confessed that there is no hope for earth. They are all going to die. Murphy asks, through her tears, if Amelia and Cooper knew that. Did he leave his children behind to starve and suffocate? Coop decides to return to earth. He is foiled by Dr. Mann. With only himself and Amelia surviving on the team, and knowing that years are passing on earth, he decides to slingshot around the black hole that is in this strange galaxy and use the last of their fuel to go to the third planet. At the last moment, Coop jettison’s himself away in a shuttle, leaving Amelia to go on without him, to carry out Plan B on the planet. Cooper enters the black hole, and rather than dying, he finds himself in a multi-dimensional place. He can see his daughter’s bedroom, from the time she was young to the present, all at once as time is overlapping here. Love drew him there, and he realizes that he was the ghost that came to his daughter to send a message. When the word STAY doesn’t keep his younger self from leaving on the mission, he downloads data to the watch that he gave his daughter, using morse code and the second hand on the watch. His daughter as an adult figures out the message and realizes that her dad returned to leave it. Cooper passes out….and awakens in a hospital on a space station near Saturn. Much time has passed on earth, but he still looks to be middle aged. His message worked. The people of earth were saved with most of them living now on space stations. He has an emotional reunion with his daughter, (lastly played by Burstyn) who is now elderly, and dying. She sends her father to join Amelia, who is carrying out her mission on the third planet, alone. I enjoyed this movie. I love science fiction, and especially one that has a time travel theme. This one not only explored anomalies in space, it explored big themes such as honesty, humor, survival, love and the connection between a parent and a child. Love was at the heart of this movie. Everything Cooper did was inspired by his love for his children, and the deep desire to see them survive and thrive. Love instinctively led him where he needed to go. Amelia tells Cooper, “Love is the one thing we’re capable of perceiving that transcends time and space.” I agree. Love is the constant, the fabric of the universe. I am still discovering its depth and its power to transcend.